Birds are chirping, trees are budding and droves of people are coming out of their winter habitats for some good ol’ Vitamin D. Welcome Spring! Wait, we live in Ohio and it has snowed twice since the supposed Spring debut. Fabulous. What’s a gal to do? Make a light and refreshing cocktail of course. If we can’t join all of you lucky warm weather dwellers we might as well cheers you! 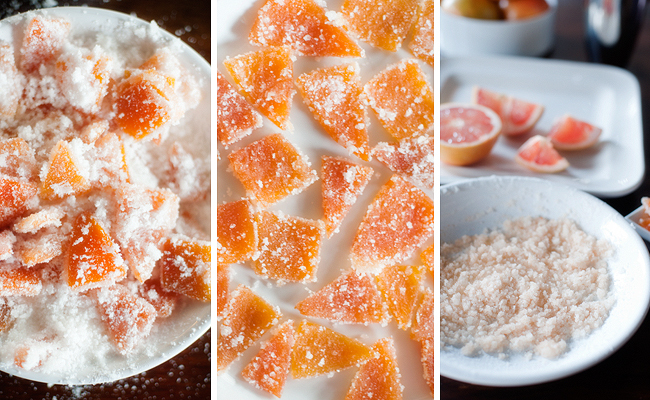 To enjoy the full experience of this concoction you need to make the candied grapefruit. If you need a drink like now, we’ll forgive you for skipping this part. 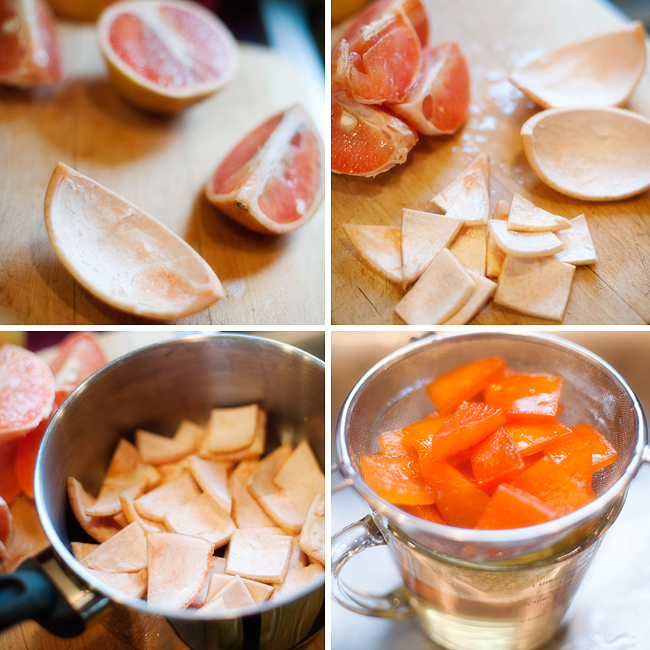 Cut the grapefruits into 4 wedges. Remove the peel from each wedge (save wedge for juice in the cocktail recipe). 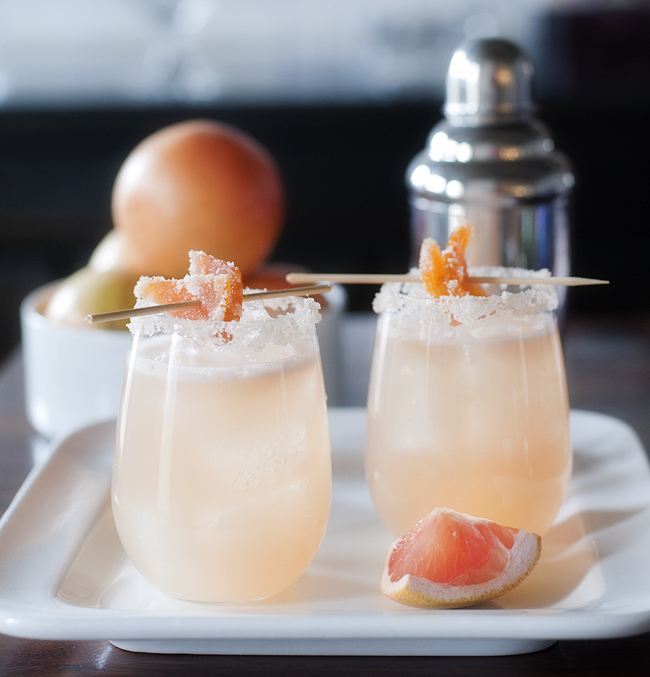 Youʼll have 8 grapefruit peels. Cut them into chunks or long strands… whatever you prefer. Place them over a stove top in a boiling pot with about 1 inch of water covering them. When the water starts to boil, remove the pot from the heat, strain the grapefruit peels and then place them back into the pot with fresh water and boil again. Repeat this step 4 times. This is because grapefruit peels are very bitter and you want to get rid of the bitter water as soon as possible. It sounds daunting but we assure you it is not. 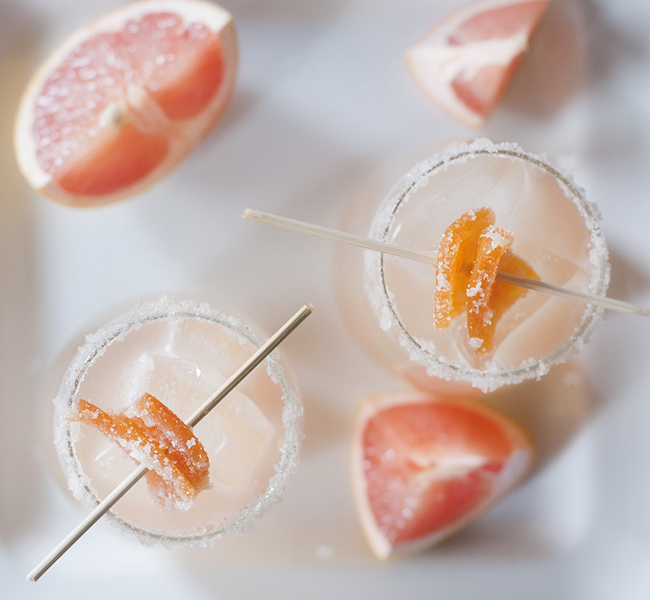 *Mix cayenne and sugar, rim glass with a grapefruit piece then dip in sugar mixture before filling with ice. The touch of cayenne compliments the gin nicely. 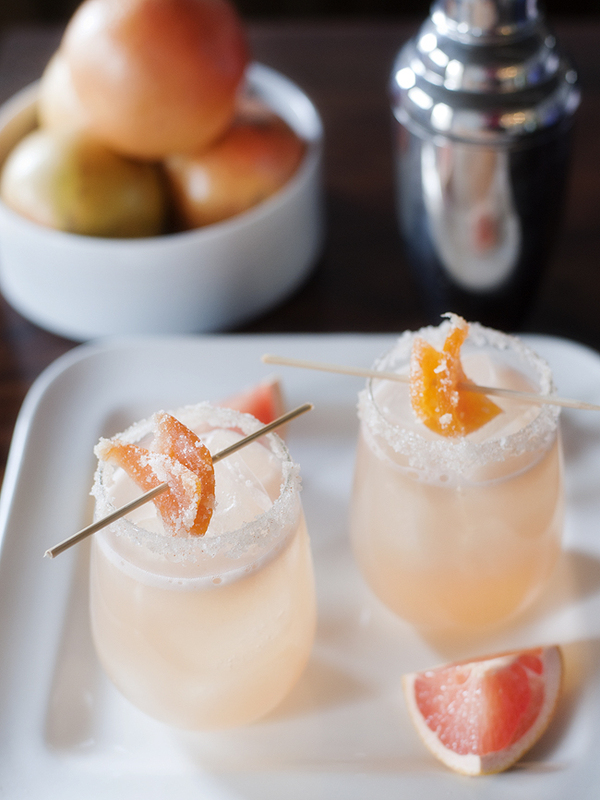 In a cocktail shaker, add ice, grapefruit juice, agave and gin. Shake several times. Pour over a 4oz glass filled with ice. 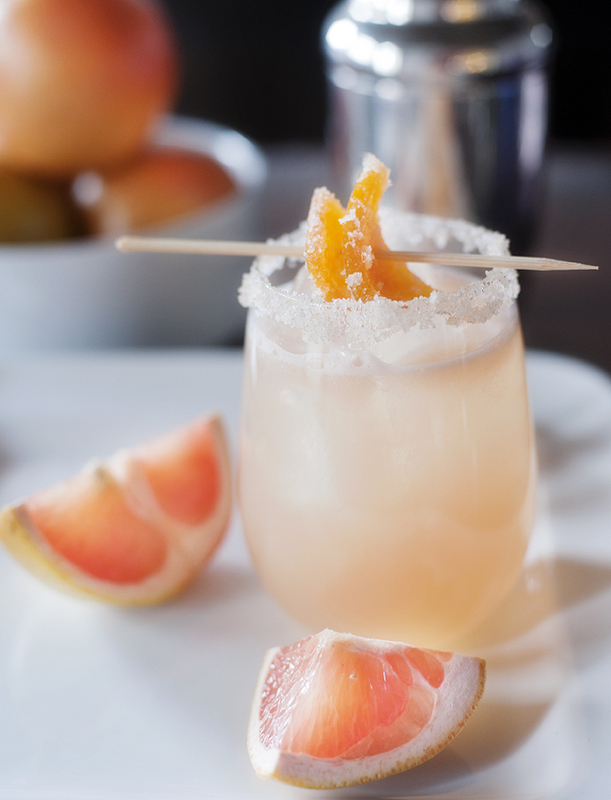 Slide two candied grapefruit peels onto a wooden skewer (cut in half) and place on the rim of the glass. Now be prepared to taste one of the best drinks you have ever had! Gin has not always been at the top of our drink choice list but this amazingly not too sweet taste of Spring has made us change our ways. You have to try this, you just have to! It will without a doubt chase away the stink eye you’re giving this so called lovely weather (if you live somewhere that is having a legit Spring, we don’t want to hear about it – at least not until we’ve had our cocktail). This entry was posted in Cheers!. Bookmark the permalink. I definitely need a glass of this stat! Pingback: Yummy Cocktails In Every Colour For Your WeddingIVY & Co.
could you do the same thing with lemon/lime peels? Has anyone tried that? absolutely love the photography in this post! Hi, great photography. 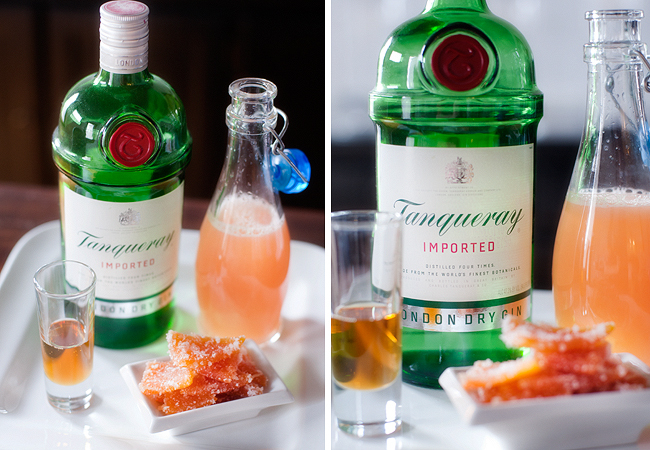 Why did you choose to use tanqueray gin?